This compact and lightweight baby bottle steriliser holds 4 Vital Baby® bottles and sterilises in just 4 minutes. If unopened the contents stay sterile for up to 24 hours. The steriliser is also compatible with other baby bottles and breast pumps. 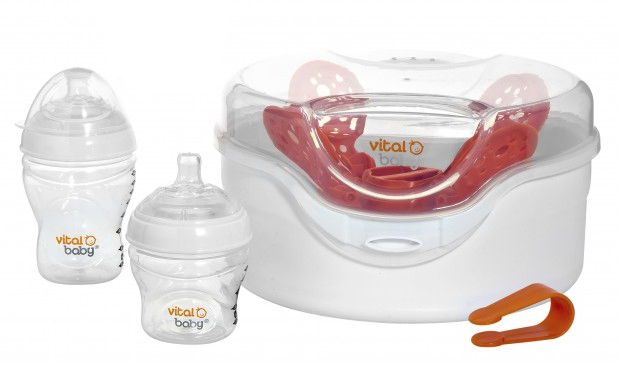 Vital Baby® Nurture™ Microwave Steam Baby Bottle Steriliser provides safe sterilisation in 3 simple steps, simply add water, load and the put in microwave. This is a great product that makes sterilising bottles and breast pumps super easy. It is a good size and can be used with any brand of bottles. It fits perfectly in the microwave and can be stored in there to save space. The fact that it comes with two bottles makes it good value for money.